TNT Speedway 2002 Awards Banquet (1/11/03) - Fritz was awarded his Street Stock championship trophy at the TNT Speedway 2002 Awards Banquet. 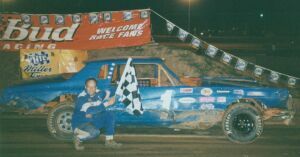 He was also awarded Street Stock Sportsman of the Year, and received an award for winning the most Street Stock heat races. Tate picked up his Bomber championship trophy and was awarded Sportsman of the Year in the Bomber division. 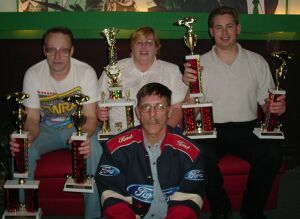 Fritz, Marlys and Tate with their 2002 championship trophies with pitman Neal Slizewski at the TNT Speedway 2002 Awards Banquet. Riverside Raceway (9/15/02) - Fritz had a great night at Riverside. He won from the pole of the Street Stock heat race. He also worked his way through traffic to win the feature. 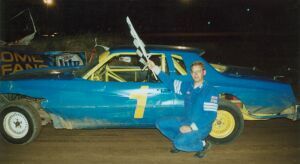 Tate also raced in Street Stock. He finished 4th in the heat after starting 6th. Tate moved from 4th to the lead in the feature but a broken axle ended his night. Marlys had a very good night in Pure Stock. She won her heat race from the pole position. She started the feature in 4th and finished in 2nd. Riverside Raceway (9/14/02) - Rainout. Marlys carries American flag at Riverside Raceway. TNT Speedway (9/7/02) - Fritz was able to get his old Monte running just in time to race at TNT. He finished 2nd in the Street Stock heat race, but bent a spindle in an early wreck. The spindle was fixed after the heat. In the feature Fritz worked his way up from his 12th starting position to a 5th place finish. The feature only ran half the scheduled laps due to numerous cautions. Tate also ran Street Stock in the Monte normally run by Fritz. Tate finished 2nd in his heat and finishing 8th in the feature after starting 9th. Marlys ran in Bombers for the first time this year at TNT. She ended up 4th in her heat. Marlys ran well in the feature, leading much of the race, and eventually finishing 3rd. TNT Speedway (9/6/02) - Rainout. WEEK 16 - Marlys wins first championship! Riverside Raceway (9/1/02) - Marlys wins the Riverside Raceway Pure Stock championship! The races were rained out on championship night and no raindate is planned. Marlys finished with a comfortable lead in the Pure Stock division, and won her first track championship. Fritz finishes 2nd in Street Stock points for the 2nd year in a row. Riverside Raceway (8/27/02) - Marlys had another good night of racing finishing 2nd in her Pure Stock heat and 3rd in the feature. She will just need to start the feature next week in order to win the Pure Stock championship. Fritz won his Street Stock heat race. Unfortunately just about everything that could go wrong did go wrong in the feature. Within the period of a few laps he ran over a bumper which poked a hole in his oil pan, flipped his belts and punctured a tire. He could not finish the race. WEEK 15 - Scharfs repeat as TNT champions! TNT Speedway (8/24/02) - Fritz wins the TNT Speedway Street Stock points championship for the fourth year in a row! Fritz won his heat race from the 3rd place starting position. The win meant he just needed to take the green flag in the feature in order to secure the championship. It looked like Fritz had a chance to win early on but a loose fender sent him off the track early. He finished 13th. Tate wins the TNT Speedway Bomber points championship for the second year in a row! Tate won his Bomber heat race from the pole position. Just like Fritz, Tate only needed to take the green flag in the feature to win the championship. He started in the 7th position and finished 3rd. Riverside Raceway (8/20/02) - Fritz won his second Riverside Street Stock feature in a row. He finished 2nd in his heat race and closed to within 4 points of the point leader. Marlys finished second in her Pure Stock heat race. She took a hit or two in the feature and went on to finish 3rd. TNT Speedway (8/17/02) - Fritz had a tough night of racing in Street Stocks at TNT. He spun while leading his heat race and ended up finishing 4th. He finished 7th in the feature after pulling out near the end of the race due to a flat right rear tire. It looked like Fritz would lose many points to the current point leader who won his heat race and the feature. But the point leader was found to be under weight after the feature and forfeited all of his feature points. Because of that mistake Fritz took over the point lead for the first time this season with the championships being decided this coming weekend. Tate won his Bomber heat race from the inside second row. He was fortunate to draw the pole position for the feature because only four laps were completed due to numerous lengthy yellows. Tate won the feature race and scored his first clean sweep of the year. He lengthened his Bomber point lead by a bit as well. Riverside Raceway (8/13/02) - For the second week in a row Marlys finished 2nd in her Pure Stock heat and feature. She continues to maintain a sizeable point lead. Fritz finally won his first Riverside Street Stock feature of the year. Fritz dodged a bullet because his right rear tire was flat after he pulled into the pits after the feature. He finished 4th in his heat race, and closed the distance between himself and the point leader. TNT Speedway (8/10/02) - Fritz had a great night in Street Stocks at TNT. He won his heat from the outside front row position. Few laps were run in the feature due to several wrecks. Fritz stayed out of trouble and moved from his 11th starting position to 2nd. He is now only seven points behind the point leader. Tate finished 3rd in his Bomber heat after a 7th place start. Tate was battling with several cars for the lead for much of the feature race. He worked his way up from 9th to a 2nd place finish. Riverside Raceway (8/6/02) - Marlys had another good run finishing 2nd in her Pure Stock heat and feature. Fritz finished 4th in his Street Stock heat and 3rd in the feature. TNT Speedway (8/3/02) - Rainout. Riverside Raceway (7/30/02) - Marlys finished 3rd in her Pure Stock heat. Marlys was moving her way to the front in the feature until she hit a bump hard in the corner. She still managed to work her way up from the back a second time and finish 3rd. Fritz continues to struggle at Riverside finishing 5th in his Street Stock heat and feature. TNT Speedway (7/27/02) - Rainout. Riverside Raceway (7/23/02) - Marlys had a solid run. She narrowly won her Pure Stock heat race. In the feature she worked her way up into a three way battle for second place and ended up finishing 4th. Fritz finished 4th in his Street Stock heat and feature. TNT Speedway (7/20/02) - Fritz won his Street Stock heat race from the 2nd starting position. In the feature he finished 4th after starting 8th. Tate also won his Bomber heat race from the 2nd starting position. He started in the 6th position in the feature and worked his way up to a 2nd place finish. Riverside Raceway (7/16/02) - Marlys continued to lengthen her point lead at Riverside in the Pure Stocks. She finished 2nd in her heat after getting spun. She had another solid feature finish, moving up to 2nd place after starting 9th. Neal Slizewski had a clean sweep in Pure Stock in his Thunderbird. Fritz finished 3rd in his Street Stock heat and feature. TNT Speedway (7/13/02) - Fritz finally got his first feature win of the year. He started on the pole of the Street Stock feature and led all 20 laps. He finished 4th in his heat race. Tate won his 3rd Bomber feature of the year. He started 5th and made a quick run to the front early in the race. He finished 4th in his heat race. Riverside Raceway (7/9/02) - Marlys had another great night at Riverside in the Pure Stocks. She endured a faulty ignition switch and a couple hard bumps in the feature to collect her 4th feature win this year. She finished 3rd in her Pure Stock heat race. 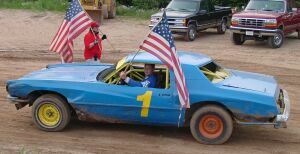 Fritz had his best finishes of the year in Street Stock. He won his heat race and finished 2nd in his feature. He is currently a close 2nd in points in Street Stocks at Riverside. TNT Speedway (7/6/02) - Fritz started on the pole and lead every lap in his Street Stock heat race. The track was very fast for the Street Stock feature. Fritz finished 3rd in the feature after starting 8th, and closed the gap on the point leader. Tate finished 3rd in his Bomber heat race after starting 3rd. In the feature Tate finished 2nd after the leader was spun out taking the checkered flag. Riverside Raceway (7/2/02) - Fritz had one of his best nights of the year by finishing 2nd in his Street Stock heat race and 2nd in his feature. Marlys finished 2nd in her Pure Stock heat and finished 4th in the Pure Stock feature. 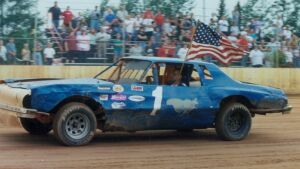 TNT Speedway (6/29/02) - Fritz had a tire going flat in his Street Stock heat race and finished 5th. Unfortunately his 5th place heat finish meant starting near the back of the Street Stock feature. But Fritz had an excellent run in the feature, moving up from his 13th place starting position to finish 3rd. Tate finished 2nd in his Bomber heat race after starting 6th. A poor draw for the feature put Tate back in the 9th place starting position for the feature. Accidents took their toll on the competition which helped Tate win his second feature of the year at TNT Speedway. Riverside Raceway (6/25/02) - Marlys won her first heat race of the year in Pure Stock. In the feature Marlys managed to work her way up to 4th place. She still has a sizeable point lead in Pure Stock at Riverside Raceway. The Street Stock class was short of cars with only four showing up this week. Fritz finished 3rd in his heat and 2nd in the Street Stock feature. TNT Speedway (6/22/02) - It was impossible to find much bite in the heat races due to the dry track. Fritz started in the back of his Street Stock heat race and worked his way up to a 3rd place finish. He finished 5th in a large feature after starting 7th. Tate broke the right axle in hot laps. He didn't make much headway at all in his Bomber heat race partly due to the track surface. He started 6th and finished 5th. The feature went better as he finished 2nd after starting 7th. 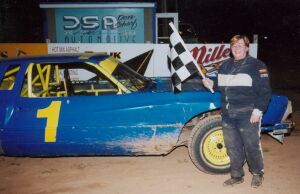 Riverside Raceway (6/18/02) - Her feature win streak came to an end but Marlys still had a very good night in Pure Stock. She finished her heat in 2nd. She survived a big wreck early in the feature and went on to finish 2nd, and managed to extend her points lead. Fritz broke an axle in his heat race and was credited with a 3rd place finish. After a busy intermission making repairs he went on to finish 3rd in the Street Stock feature. TNT Speedway (6/15/02) - Rainout. Riverside Raceway (6/11/02) - A wet track and a late model show helped create large holes and a heavy cushion at Riverside Raceway. Passing was difficult, as was surviving the holes. Marlys finished 2nd behind Neal Slizewski in her heat race. She remains unstoppable in the Riverside Pure Stock feature. She went on to win her third Pure Stock feature in a row after starting from the back of the feature. She was able to dodge many of the holes which took a toll on the competition. Fritz finished 3rd in his Street Stock heat and 2nd in the feature. TNT Speedway (6/8/02) - Fritz started in the back of his Street Stock heat, but still went on to win it after starting in the 5th position. Fritz finished 3rd in the feature from his 3rd place starting position. Tate worked his way up from his 3rd place starting position to win his Bomber heat race. The radiator developed a leak in the heat races and was changed during intermission. In the feature he started 7th and managed to work his way up to a 4th place finish. Riverside Raceway (6/4/02) - Rainout. TNT Speedway (6/1/02) - Fritz brought his newest Monte Carlo out for the first time this year. Fritz had battery problems before his Street Stock heat race. The car finally started as the rest of the field was lining up on the track. Unfortunately two of the trunk pins weren't securely fastened after all of the battery related work. At the drop of the green flag Fritz jumped into the lead from his outside front row starting position. A lap into the race his truck came loose and was flopping around the back of the car. Fortunately one pin held and Fritz was able to continue on for the win. In the feature Fritz moved up from his 9th starting spot to finish 3rd. Tate won his Bomber heat race after starting on the outside front row. Tate fell to second after the green flag dropped but was able to pass the pole sitter within a couple laps. In the feature Tate started on the inside second row. After falling to 4th Tate worked his way back into 2nd but was unable to pass the leader during the remainder of the feature. Riverside Raceway (5/28/02) - Fritz finished 2nd in the Street Stock heat and 4th in the feature. Marlys repeated last Sunday's great performance by finishing 2nd in her Pure Stock heat and winning the feature. She is currently the Pure Stock point leader at Riverside. 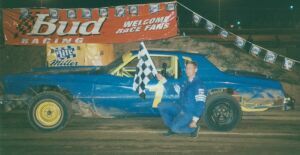 Riverside Raceway (5/26/02) - Fritz finished 3rd in the Street Stock heat and feature. Marlys finished 2nd in her Pure Stock heat race. In the feature Marlys quickly moved up from her 5th place starting position into the lead. Lapped traffic slowed down her progress near the end of the race, but she was able to defend the lead and take the win. TNT Speedway (5/25/02) - Fritz finished 2nd in his Street Stock heat race after starting in the back and surviving a couple hits along the way from other drivers. Fritz started on the outside front row the feature and finished 3rd. Tate worked his way up from his 3rd place starting position to finish 2nd in his Bomber heat race. Tate started on the outside front row of the Bomber feature and led every lap to win it. Several cautions took out most of the drivers and the feature only ran about half the normal number of laps due to the time limit. TNT Speedway (5/18/02) - Even though Fritz could barely walk due to his broken ankle, that didn't seem to slow him down at all for the TNT Speedway opener. Fritz started on the pole of his Street Stock heat race and went on to lead every lap for the win. His draw for his feature starting position wasn't nearly as good though. Fritz started the feature in 9th, but worked his way up to a 4th place finish. Tate won his Bomber heat race after starting in the 4th position. Tate finished 2nd in the feature after starting 5th, and takes the lead in Bomber points. 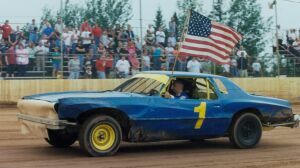 (5/6/02) - Fritz plans on racing Street Stocks at Eagle River and Three Lakes this year, but will pass on Antigo in part due to his broken ankle. 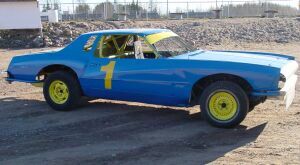 Marlys plans to put in a full season at Eagle River in Pure Stock and will share the driving duties with Tate at Three Lakes in Bombers. Marlys will get fresh fin for her Monte this season. 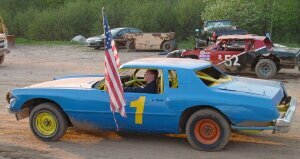 (2/27/02) - Fritz plans on racing up to three nights a week again this year in Street Stock. Marlys will be racing at least one night a week in Pure Stock. Tate's (my) racing schedule is still up in the air at this point. This website was finally updated for the first time in a few months. Changes were made to the driver info section, and the 2001 racing news was moved from this page into it's own page. Several pictures were also added to the 2001 racing news. More updates to this site will be coming over the next several weeks. New tin for Marlys Monte this year. Click here for more pictures from the 2002 racing season. Click here for final point standings from the 2002 racing season.